The program titled Winter Fest was jointly organised the Russian Centre of Science and Culture and several academic bodies in the Indian capital and dedicated to the XXII Winter Olympics in Sochi. 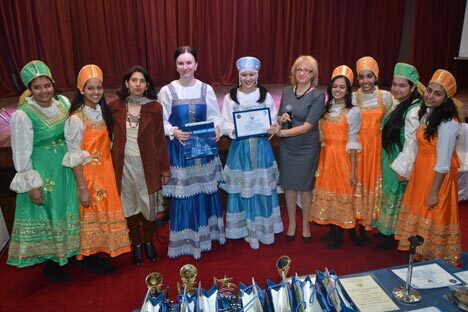 The Russian Centre of Science and Culture (RCSC) in New Delhi, the Delhi Public Schools’ Society and Delhi Higher Educational Institutions with the support of the Indian Association of Russian Compatriots (IARC), organised the traditional annual Days of Russian Language, Literature and Culture on February 11-12. The program titled Winter Fest was dedicated to the XXII Winter Olympics in Sochi. The programmes prepared and conducted by Tatyana Perova, Head of the Russian Language Teachers’ Training Centre and teachers of the Russian Language Institute, RCSC comprised of ‘Olympics’ on the Russian language, literature and culture, as well as a competition on the best translation from Russian into English. Winter Fest also involved presentations and slideshows on the Winter Olympics in Sochi, an essay competition and a Russian costume competition. The RCSC held workshops on Russian folk dance and songs, as well as screenings of modern Russian films. Russian observers felt that the performance by students from the national capital region sent across a clear signal that they possess an ardent interest and high enthusiasm not only in mastering the Russian language but also in grasping Russian art, culture and history. The jury members were also impressed with the poetry recitals and songs performed by students and noted their diction, intonation and pronunciation. Nine schools in the national capital region were represented in the junior event, including DPS Dwarka, DPS Indirapuram, DPS Noida, DPS Mathura Road, DPS Greater Noida, DPS Faridabad and Bluebells School International. The senior category students came from Jawaharlal Nehru University, Delhi University, Jamia Millia Islamia, Dr. B. R. Ambedkar University (Agra), Amity University, Haryana, and the Institute of the Russian Language, RCSC. The winners were presented with trophies, certificates and Russian Souvenirs. Several major Russian cultural programmes will be held across India this year as a part of the ‘Year of Culture in Russia – 2014' celebrations.